For the first time, prosecutors in Brazil will investigate allegations of corruption against former President Luiz Inacio Lula da Silva. He has been accused of involvement in an illegal scheme that used public funds to pay coalition parties for political support. Lula, as he is universally known, has always denied knowledge of the scheme. Several of his close aides have been convicted for their involvement in the scheme. A businessman at the centre of a long-running corruption scandal, Marcos Valerio, told prosecutors last September that the former president knew of the scheme and had received money from it. Mr Valerio, who worked closely with Lula's Workers' Party (PT), was giving testimony in a bid to reduce his 40-year sentence on corruption charges. He was convicted last December with 24 other associates and close aides to Lula in a landmark trial heard by Brazil's Supreme Court. Over the course of the trial, 25 people were convicted for setting up a scheme that used public funds to pay coalition parties for political support. Several were top politicians of the governing PT. Among those convicted was Jose Dirceu, who was Lula's chief of staff from 2003 to 2005, He was sentenced to 10 years and 10 months in jail. The former head of the PT, Jose Genoino, and its treasurer, Delubio Soares, were also convicted. The scandal, which erupted in 2005, threatened to engulf Lula's administration for a time but he was comfortably re-elected as president the following year. Lula himself was not implicated in the case and has denied any knowledge of the scheme. 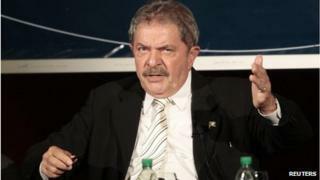 He left office at the end of 2010 with huge approval ratings, and remains a popular figure in Brazilian political life. The trial, which became known as the "Mensalao" or the "Big Monthly" allowance, was seen as a key test of Brazil's ability to hold its politicians to account for corruption.